Here is a video on the overview with explanation on common obstacles and possible solutions. Let me go through the common issues and solutions with these frequently asked questions from readers. This is especially applicable for those who do not plan to practice public accounting in the US. 1. Do I have to work in public accounting (anywhere) to get the license? No, for most states. While a handful of state boards recognize public accounting as the only CPA experience requirements, most states allow non-public accounting, taxation or even academic/teaching work as valid experience. 2. Do I have to work in the US? No. The rule is on the verifier instead of the location of the workplace. 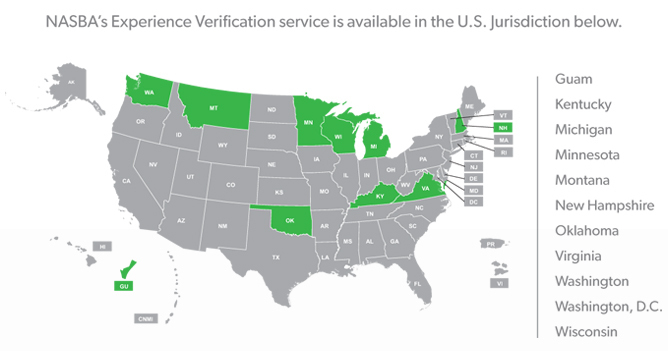 Specifically, for most states, the verifier has to be an actively licensed US CPA (from any states). This means that retired or inactive licensees, as well as CPA certificate holders are not qualified as verifier. In most cases this verifier must also be your direct supervisor. Getting back to the question, if you can find a US CPA to work under but the opportunity is outside of the US, it is perfectly fine. Many overseas US CPA may not keep their license active so make sure you check with your supervisor on the status of his/her license. 3. I have 5 years of public accounting experience under an active and reputable Indian chartered accountant. Can it be counted? 4. What are the states that don’t require the CPA verifier to be your boss? Montana, Washington, Arkansas* and Indiana* are some of the states that allow a CPA to verify your experience without being your supervisor. This adds a lot of flexibility, because they can in theory verify your prior experience (even outside of the US) as long as they are relevant. * These states require applicants to submit their social security numbers, which might be an issue for international candidates. 5. Are there any states that allow a non-CPA supervisor to verify? Yes. Illinois, North Dakota**, Ohio, Virginia and Wisconsin do. Note that Ohio and Virginia require candidates to have SSN in order to sit for the exam. ** Rules changed on April 1, 2016: ND now requires experience to be verified by a CPA or equivalent. 6. How many years of experience are the state boards looking for? It depends on the state, but in most cases only 1 year is required. Some states ask candidates who work in non-public accounting to accumulate one additional year (i.e. 2 years) of experience before getting the CPA license. 7. Do State Boards count the experience before the exam, after the exam, or both? It depends on the state, but for most states they are quite flexible, i.e. they count experience you gained before, during or after the exam. If this is a concern because you don’t plan to work in accounting in the future and rely on counting the experience you had previously, double check with your state board beforehand. 8. I passed the CPA exam, then realized that I can never fulfill the CPA experience requirements of my state. Can I get the license from another state, and if so, which one? Check whether you fulfill the education requirement of the states mentioned in Questions 4 and 5. If so, you can arrange an exam credit transfer. Credit transfer is only possible if you complete the exam requirement of the state to be transferred. For example, if you originally registered for New Hampshire because it requires the least accounting credit hours, you can’t expect to switch to Virginia without making up the accounting classes. In other words, the state boards don’t let you game the system. The application can be an exceedingly complicated process, and the outcome often depends on your unique educational background and situation. I would love to help as much as I can, but in many cases it is easier and more efficient to do your own research and decide accordingly. There exists a database that contains the rules and regulations of the all state board regarding the CPA experience requirements and licensing rules. Every one can access with a fee. If you are serious about the exam, I encourage you narrow down your choice to no more than 5 states, free up half a day and buy a 24-hour pass for US$10. It’s worth it. NASBA recently launched an experience verification service, with a client manager guiding you from start to finish. The catch is that it’s only available in 11 states / jurisdictions and the service is expensive ($500 for domestic candidates and $700 for international candidates). If you want a relatively hassle-free experience and don’t mind the cost, check it out here. If you have a particularly tricky situation or need advice from an expert, Leslie-Anne Rogers might be able to help. She has been in this business for 20+ years. Note that this is her full-time job and please expect to pay a fee, and that transfer success is NOT guaranteed. You can find my interview with Leslie-Anne here. Can I get a CPA certificate instead of full license? Are You Serious about Taking the CPA Exam? Hello, am living in Oklahoma And already has my educational requirements which is 150 credits hours but the experience I have was in Nigeria and I just want to know how I can do it for me to be able to write the exam and get my license. If you have a graduate degree, you can get a non-reporting license from Massachusetts which doesn’t require working experience. There are also other flexible ways as mentioned above. If you have specific items above that you don’t understand, just let me know or check with the respective state board directly. Good luck! Hi Cinusa, I am not sure if I understand, but if you, say, worked for 7 months, then your 7 months can be counted as long as you can get it verified by your supervisor (depending on state, but likely required to be a CPA). What about TN and/ or GA? Is either one nonworking experience state? Hello my name is Fanaye Zegeye I came from Ethiopia by DV lottery, when I was in Ethiopia I have a masters degree in ecnomics and worked more than three years, now I finished my evaluation to USA. So what’s the next step?l live at aurora colorado. If not (including whether it seems possible for you to fulfill the working experience requirements), then you may consider other states. Thank you so much for this website. I am pretty close to finishing up my Bachelor’s and immediately pursuing a master’s degree. However, I am in the military currently so unfortunately I will not have any working experience when I get out with a master’s. I think that Massachusetts might be the way to go. What are your thoughts? Hope you’re doing well! Your website is super helpful. My name is Ritika. I have passed the CPA exam under the New Hampshire board. I am currently residing in Illinois and on H4 visa. I will be moving to India in two years time. I want to apply for CPA license so that I can work in India with it. Can you please guide how to go about it. I am currently volunteering with American Red Cross in their Finance Management department for a year. Can I use this experience for obtaining my License? Thanks for your reply. I do have a masters degree in taxation from US university. Please correct me if I’m wrong. But I can get a non – reporting license from Massachusetts and use that in India? Any suggestions to other routes to get the license? Also, once I get the license, can I comply with CPE requirements in India? Thank you so much for all your help. I really appreciate it. Hi Ritika, I believe so, no problem using that in India as long as you don’t sign audit report. You can always upgrade this to the full license if you have the verified experience. Another popular route is to go through North Dakota where non-CPA supervisors can verify your experience. That is a full license. I have passed the CPA exam under the CA board. I am currently residing in CA and work for NGO as financial analyst for last 2 years(Non CPA supervisor). I want to apply for CPA license . Can you please guide how to go about it. Can I use this experience for obtaining my License? Also I have master degree (2 year) and Bachelors degree (3 years) from india. Can I get Massachusetts NON reporting licence? Thanks for your note! MA is an option, or you can try Virginia, since it is a full license and the only difference is that your supervisor doesn’t need to be a CPA. You have the relevant experience anyway, so why not get a full license right? North Dakota works too but now that they are planning to change their rules, I would just go for VA assuming there are more receptive to candidates in your situation. Hi read your post .I m living in canada.i have 3 years b.com.and two years master in information technology from india . And 1 year post graduation diploma in bussiness management HR which is from canada community college. I m permanent resident of Canada I have us 10 years visitor visa. is i elegible for that or not? Hi Good day every one. I really admire this website. It is very helpful for CPA Students. This Site May have lead to 5% increase in CPA pass percentage by now ! I want to know whether a CPA with active license Sign Audit Reports & Launch a CPA Firm in a country other than U.S.A ? If So, Do U.S based Businesses Prefer to become a client of such CPA Firm . XYZ Inc. From Virginia Chooses to consult an oversees CPA Firm for Book Keeping ,Taxation & Audit .Is this possible ? How are U.S Audits assigned to CPA Firms outside USA ? If not then how can Licensed CPAs use the CPA designation in countries other than USA ? And also Can The CPAs who are not US Citizens Sign Audit Reports And Launch A CPA Firm in USA or become partner in an existing CPA Firm ? It would be a Gift on the ocassion of New Year to Readers if the tricky questions like above and many more (questions related to CPA Practise Dos and Donts) are compiled into an FAQ Page on this website . Moreover , Readers are highly benefitting from your effort Stephanie . Keep it up ! Hats off ! Hi Labhesh, thanks for your note! I guess it depends on each country on how the US CPA is recognized, so it is hard to give a general answer. Hope you are doing fine. Recently I have moved to California, n I m on H4 .I have done B .com and M .com from University Of Delhi, India n I m also B .ed. I have 3 years of teaching experience at graduate level where I taught accounting and business law. 1) can my teaching experience be considered ? 2) on h4 how can I work in US to gain experience under a CPA ? 3) work experience is required before appearing for exams or after passing all 4 papers also , I can take work to fulfill experience qualification ? 4) If I give test in California , can I work anywhere in US ? Yes I taught accountancy at university level for 2 years . I wanted to double check about my eligibility regarding qualificafion and experience.can u suggest me whom can I approach for this officially. I mailed CBA but there is no reply from their side. Great website…. I passed the CPA exam over 20 years ago. I received my Bachelor’s in Accounting 27 years ago and have worked in governmental accounting for 30 years. We have CPAs that can verify my experience however there are no counselors to advise on the new 150 credits education requirements. I have also a sign language certificate which I believe will satisfy some of the credits. Please advise of best resource to analyze my transcripts. The CA outline for 150 credits is a little confusing. Thank you for your time and for this website. But sounds like you are from CA? Then they don’t have it. There are professionals who work with candidates to figure out the qualification issues. Leslie-Anne Rogers is one of them. She focuses more on international candidates because that’s where the demands are, but I am quite sure she can help you as well. There are fees involved though, basically to purchase the CPAexcel course, but the course itself is pretty good and if the state board ends up rejecting the application, you get a 95% refund. Update: sorry I just realized you passed the exam. You can still contact Leslie-Anne. I think you may be able to pay only for her services. Thanks so much Stephanie…. your website is a breath of fresh air. It definitely provides guidance in a one-stop shop for any CPA candidate that I have not seen anything similar, even the State Board site. Thank you for all the helpful information on your website. I passed the CPA exam in 2014, and I’m trying to get a CPA license in California. I have some questions about my work experience, hopefully I can get some advises from you. I’m currently working at a small company as their accountant. I was volunteering there for the last 2 years and only started full time this year. I report to our CEO and a outside CPA consultant. Can the outside CPA consultant verify my work experience? Thanks for the prompt reply Stephanie! I’ll check with CA State board and let you know. I have done my Bachelors in Commerce from University of Mumbai, India which is a 3-year course. I have done my Company Secretary -professional programme from the Institute of Company Secretaries of India and I have cleared CA-Inter (second level) from the Institute of Chartered Accountants of India. I have 3 years of articleship(Internship) experience working under a practising India Chartered Accountant in the areas of Indian Accountancy, Taxation , Audit etc. Currently working with a Public limited Company as accounts officer in ERP . I would like to know my elgibility reqyuirements for CPA course. Also if u could tell me if I am looking forward to settling abroad in Canada, will a CPA Certificate with inactive license fetch me a decent job over there or for that matter in USA , if I dont intend to go for public practise ever? Stephanie.. thank you for your quick response.. really appreciate it.. although I have Canada in my list but I am still exploring my options.. and that’s why I wanted to know whether a US CPA with an inactive license is recognised in Corporates world wide so that in fututre should I relocate any where else including India or else where…. Your website is very helpful. Thank you !! I looked for information about CPA program for many hours and I didn’t find too much interesting website content as yours. So thank you again. Well, I am Najat and I am actually interested in preparing the CPA exam. I got a bachelor’s degree in Finance and accounting and a master’s degree in auditing and business control. I studied in Morocco and France and I am now planning to pass the CPA exam in the Middle East. I’m not really interested in working as a public accountant. It will be for me a general training to prepare my career to be a finance manager or a CFO. I would say that preparing a French PA porgram is easier for me but as a woman interested in working in the “English spoken” world, the american CPA program sounds better! I got an experience in finance, financial controlling and internal auditing. I would like to know if the experience requirements are essential to get the certification. If so, do I have to work for an audit firm? Being a French educative product will make it harder for me as a potential candidate for the exam? Thank you very much for your helpful advices. Well, I saw your videos about the educational and experience requirements for international students and I would say that the way you present information is very simple. As I told you in my previous comment, I am not really interested in working as a Chartered Accountant. It will be more like a certification for me ! What I can’t understand is how international students who pass the CPA exams in international locations as UAE, Doha, Egypt,…get a license. Do they need it for such locations or do they have to choose a US exam location as Massachusett’s to get one ? Hi Najat, thanks for your note and glad you find the videos helpful. The licensing process for international candidates is the same as that for the US ones. In most states, we need an active US CPA to verify our experience and this can be done in US or elsewhere. The point is not where we work, but under whom we work. There are more and more licensed CPAs in the Middle East given there are exam sites there, so it is not as tough finding one to work under as before. I just watched a video about the international examination. Now, I understand how it works : You choose a state which offers you the possibility to pass the exam in another location abroad for the same state. You just have to match the experience requirements and of course get the right exam scores and educational credits in order to get the CPA license. Massachussets is an excellent choice as you said (thank you again) ! But, it requires a social security number 🙁 Is there any other option for the same state or another one ? Thank you so much for the insights. Your write-ups are very helpful. I hope you will be able to help me. I have a bachelors and masters degree in business. I am looking to switch to accounting, and would like to get my cpa. I have only taken three introductoryaccounting classes. Is it wise if I go back to school to get another bachelors degree in accounting. I have 3 out of my 4 exams passed and the last one scheduled this month. Some of my scores expire in June but I won’t complete my experience requirement until August. Do the test scores expire if I am not yet eligible for licensure because of my experience requirement in NY? I’ve passed all 4 exams in Florida and only needed 6 upper accounting credit hours to fulfill the requirements. I took 2 classes (6 credit hours) but found out 1 class was considered same class from another university leaving me with 3 credit hours deficient. Unfortunately, the 3 years rule in Florida (the rule stating exam scores expires after 3 years) I think is now in affect. Is there anything I can do?! Please help. Thank you for all the great info! I am somewhat confused on my situation. I would like to prepare and take the CPA exam within the next year. I worked for about a year at a firm that had a CPA, but not directly under that person. I am now working at a small company as an accountant, specifically in accounts payable. My question is, how can I obtain verification from a CPA to get certified and does my experience in a small company count? Is it possible for me to ask any CPA to help verify my experience or do I have to work under their direct supervision? I live in Iowa and I’m having a hard time finding clear information. Hi Judith, it really depends on the rules of IA state board. A few states do require direct supervision while others are more flexible. But getting experience from a small firm isn’t a problem at all as long as your supervisor is CPA. Accountants and can not find anything referring to distance learning courses. If you can please help me I would very much appreciate it. Hello Stephanie thanks for the support you continue to provide. my education took place in UK where i completed an undergraduate and a masters degree in accounting and finance. Until now i hace nevef been able to find job for required experience. I want tk start my cpa to increase my employability abroad. Which state would suggest i register with and do you think i would be able to get exemptions? Hi Etienne, are you now living in the US? If so, register in your own state. With a master’s degree in accounting you should be fine with both the 150 rule and degree requirements, and likely also for the minimum accounting course requirements. I considered South Carolina because I have family members resident there and thought it might be more appropriate. Considering the requirement of a social security number, I would wish that you advice on a State that would best suit my desire. I’m a 3 year bachelor degree holder from India currently working for an US based bank in India. Can you assist me as to what my step should be to be able to obtain a CPA license. Thank you for this website and all your effort to bring in so much information. I have passed two exams and intend to write the other two in the next window. I need your advice to help me out with certain complications. I currently reside in India have 1 year experience in public accounting ( pre- exam) and 150 credits. I would be immigrating to canada post my wedding this year end. I want to know if any state in Usa would accept canadian work experience for my license and if my cpa license would be accepted in canada or are there any further requirements for me to practice as a Cpa in Canada. I am Chintan Karani, citizen of India. I have passed the CPA exam under the California board. I am currently residing in India. My education profile includes 3 years B.Com, 1 year M.Com, and Indian CA. I have full time work experience of 4 years in the area of accounting, taxation and auditing. I do not have any work experience under a licensed CPA. Can you suggest me whether I am eligible to apply for CPA License in CA board? If not can I get my License from any other state? I worked for a public accounting firm (in California) for almost 2 years in the audit department, but I left the firm 8 months ago. I just passed the 4th exam, however I kept no records detailing my experience. How do I move forward from here to fulfill the experience requirement? I passed all CPA exams of New Hampshire in Oct 2013 and worked for a small CPA firm in Chicago from 2013 to 2014. I tried to contact with my ex-supervisor(IL CPA) for working experience verification. But he gave me a lot of excuses and refused to sign the verification form for me. I don’t know what I can do? Now, I live in CA and want to get a CA CPA license. I heard that applying for CA CPA license is much hardier. I have few questions, hopefully you could help me. 1. How long of my CPA exam credit gonna be expired(New Hampshire)? Can I transfer my credit to other states before it expired if I cannot get license on time? If yes, what’s the ideal state? 2. I am planning to live in CA with CA CPA license. Since CA CPA license requirement is higher, do you recommend me to transfer my score credit to CA and then apply CA license? Or apply other states license and transfer to CA license, which one is better and easier? 3. If it’s too hard to apply CA CPA license, I might move to TX. Is TX CPA license requirement lower? May I transfer my credit to TX? Hi Sarah, nowadays the requirements should be quite similar given they all should follow the “3E”. Some may require more accounting credit hours than the others. I worked for a public accounting firm down in southern california for just over a year in the audit department. Since then, I have passed the exams and now want to apply for my license. How could I obtain support for the time I worked at the firm down south? I did not keep time records or have access to specific workpapers since I no longer work there or live in the area for that matter. Do I just ask HR to fill out and send the certificate of attest experience? I graduated with my Bachelors in California back in 2009 before the 150 rule applied. However I have about that many credits anyway. I have qualified several times to sit although i only took a test once. I lived in NY for about 5 years after that and worked under a few CPAs. I currently live in MN and am not currently working under a CPA. I was wondering if I can use the hours under my former bosses? Or does the work under the CPA have to be current (with in the last 2 years)? I appreciate any advice given. I will also look into applying in VA. Thanks for the information above. 1. I already worked in India for 5 years which includes 7 months relevant under a CPA. Will it count? 2. If I take up volunteering, will it also fulfill my license requirement? Hi Radhika, is it under a US CPA? Then it’s great; should count. I have graduated in B COM Form panjab university under 3 years program and done my ca-inter with institute of chartered accountants of India,Can i apply for cpa usa or austeralia or canda? I am from CA and currently working at corp environment. I want to get the CPA license just to make myself more competitive. My current director, she was an audit manager from Deloitte and has an active license. I have been working here for couple years, can she sign my license once I pass my CPA exam ? Thanks for your reply. I haven’t pass my exam yet. Is it still possible to have her to do that while I am studying for the exam? Also do I need any type of specific form for her to sign or a formal verification letter would be enough? Thank you so much, I have found this website extremely helpful in my research. I am curious if you would have come across anyone in a similar situation. I have found very few Australian CAs in the comments and I would really appreciate some advice in this regard. I am an Australian CA, I worked there for the last 7 years prior to relocating to Colorado. I know I qualify for the IQEX and I am thinking of getting my CPA license here in Colorado by the end of the year. I am slightly confused by the experience requirement for Colorado though, are you aware if I would immediately qualify for this (as I worked in Australia for the last 7 years) or would I need to get a current Australian CA to re-verify my work experience? I really appreciate your help and any thoughts you have in this regard. Thank you so much for putting this info out there! I’ve recently passed all the exams in KS only to have my previous CPA supervisor go MIA to sign off on my experience. Should I pursue the KS certificate only? Or is it worth my time to transfer everything to another state? I have many years of accounting experience, verifiable by non-CPAs and about 6 months experience under a different CPA as well. My education requirements should be met country wide & I have a SSN. Hi Andi, I would go for the full license. It isn’t too much of a hassle if you have fulfilled the license requirements of the “new” state. Just need to follow the procedure one step at a time. Good luck! I find you blog / information very useful. Is it possible to shift states mid way ? I have more than 150 credits with all the relevant criteria being filled. I am at present a candidate for California board. I am giving two out four papers this November. Owing to personal commitments, it would be difficult to travel to US post that for at least a couple of months. I wanted to change my board to one of the boards which would accept Dubai as the examination center for the remaining two papers. Is it possible to switch midway ? What would you suggest ? Thank You ! Appreciate your help ! Thanks for your note! I believe it is fine to transfer exam credits. The first step is to identify the “new” state that you are going to register. Then, email them and ask for the form that you can fill out to transfer the exam credits from California. See if it works. If not they should be able to suggest an option. I have a 3 years bachelor degree in Viet Nam and also CMA certification. Is it possible that CMA is credited by CPA Texas? Hope you are doing Fine. I wanted to seek your advice as regards the experience requirements for the CPA Certification. I have been working as a Full time PG Faculty ( for a period of 14 years now) teaching courses in the area of Finance & Accounting to MBA Students at a University in India. Would Teaching experience of this nature be sufficient to qualify as eligible experience for the CPA Certification. Kindly let me know. A great website with lot of information for becoming a US CPA. Well done!! Interested in pursuing one. I am currently a Canadian CPA CGA and has work experience in industry and public practice in Canada, which was supervised by CPA CGA’s. Do you know, which state accepts canadian accounting work experience for US CPA License.? Seocndly, i have 3 years B.Com + 3 years Masters in computer applications (MCA) from India & CGA (now CPA,CGA) from Canada. Do you know which state, i should try to enroll wrt to education part of US CPA and canadian accounting experience?. Thanks in advance. Hi Harry, thanks for your note! Yes there are quite a few states that accept verification by “CPA equivalent”. Each state define this differently, but most include Canadian CA. But I see that your boss is a CGA which unfortunately isn’t counted in most cases. I have worked with Deloitte Pakistan for 6 years. As you know Deloitte is a BIG4 global firm but unfortunately there was no partner under who work instruction I was working is CPA since most of the partners are either Pakistani Chartered accountants or ICAEW. May I know still I will be able to meet the experience requirement and if not what choices do I have. I’m Adrian. Thank you for all the knowledge shared in your website. My situation is a little bit complicated. I’m also an ACCA affiliate (I have passed the 14 exams of which five are exempted), not yet a member. I’m living in Australia. The reason why I chose US CPA exams is because it is fast. I’m currently the candidate of California and will sit for exams in February 2017. However, I don’t have SSN. So I might transfer my credits (if I pass the exams) to a state which does not require SSN for licensure. I’m currently working in an accounting firm as tax accountant. My supervisor is an Australian CA (which is under the Mutual Reciprocal Agreement) However, NASBA Experience Verification Service is only provided in a few jurisdictions in the US. Does it mean that it is impossible for me to claim my experience in Montana? Do you have any good suggestions? Thank you very much Stephanie. I am from India. I am currently pursuing B.com and plan to choose CPA. Is it okay to take up Master’s in finance? Will I be eligible for CPA or will it be considered as a non-accounting degree? If it is considered as a non-accounting degree,should do other accounting courses? I am not really interested in doing M.com. Are there states which consider non-accounting degrees? Please give me your valuable advice. Hi Vandana, thanks for your note! It’s certainly fine to take up the master’s in finance. I agree that you should choose what you like and what’s useful for your career. The only thing to consider is whether you have enough accounting credit hours for the CPA exam. Since you took BCOM you should be fine (or almost fine). You can either take a few advanced accounting courses in your master’s, or choose a state that does not limit the required accounting courses as “upper-division” courses, i.e. those in intermediate / advanced level. Good luck! Is there a required years you have to fulfill the experience requirement from the time you pass the 4 section of the examination? Is there a required years you have to fulfill the experience requirement from the time you pass the 4 sections of the examination? Superb compilation. I think this clarifies most of the doubts related to state selection. Well, I have one query- I am an Indian Chartererd Accountant and have work experience of 2.5 years in one of the Big 4 in Mergers and Acquisition. My boss was not CPA but a CA. So, can this experience serve as relevant work experience and can my CA verify my work experience. I am a CA from India wit h a 3 year B.Com. I stay in Ohio and wish to undertake CPA exams. As 3E requirements regarding credit hours is not adequate I’m mu case, I plan to do a M.Com Finance in distance education from an Indian University. Will this b adequate for the Ohio standards to appear for CPA exam? Reading Sowmya’s case, I am surprised to know that a combination of CA and B COM is also not sufficient to meet the 150 hour rule. I was in the impression that I will be able to meet that rule easily. I am also interested in selecting Ohio. Kindly provide your valuable inputs. I currently hold an Adult Vocational Education Certification and I have been teaching Accounting for at least 7 years. Question: Could my years of teaching count towards the year of experience required by the state of CA? I am currently completing a certificate course in Oregon, my resident state. My goal is to take the CPA exam, but I don’t currently work under a CPA. If a prior boss I worked with in California is a CPA, can they fulfill the requirement for work experience? I worked with him for about three years. I am really hoping you can help me. I passed my CPA examination from NH in 2010. I want to get the required experience. I work in consulting and have no plans to work in audit. Could you suggest some ways for to enable me to use CPA designation? I really dont want a full license, just to be able to use the CPA name would do. I used to work in Ernst and Young in India in Finance for 6 years before I moved to the United States. I am in the middle of taking my CPA exams in Fl. I am half way thru. I work as an accountant in a company that does not have a CPA. I have been working here for the last 4 years. How can I have my work verified for licensure purposes? I dont want to leave the company. Any advise is greatly appreciated. Thank you for such a well informed article! I do have a question though, and hope you might be able to help me. I’m living and working in Maine, and Maine requires 2 years of public accounting to sit for the exam. I have worked for the last 6 years in the private sector as the Finance Controller, and leaving this job really isn’t an option. I currently have two BAs in non-business degrees, and two Associates degrees in Accounting and Business Management. I’m looking into get my BA in Accounting or at least my Accounting Certificate, but I’m really not sure what to do about the experience requirement. I am currently the head of the finance department, but back in 2014, I did have a boss who was a licensed CPA. Is it possible to do some sort of CPA supervisory thing retroactively? My previous boss could sign off on whether or not I met certain requirements? Hope you’re doing well! Your website is very helpful. My name is Bhakti. I have passed the CPA exam and Ethics (licensing ) exam under the Montana board. I am currently residing in Indiana and on H4 visa. I want to apply for CPA license. I don’t have any US work experience. Can you please tell me how to go about it? I’m working in New Jersey but I sited and passed the CPA exam in New York and I’m applying licensure in the New York State. Can my experience in New Jersey qualify for the licensure? In addition, my supervisor is also working in New Jersey but he is licensed in New York. Can he verify my experience? Will cpa exam for california board can be written outside of US ? I have cleared all four parts of my CPA exams from Georgia. I have the required credits and also have two years work experience in Texas state. My problem is my employer had some issues with his CPA license and he won’t be able to verify the experience for me. So I am in a dilemma. I heard about NASBA experience verification. So can I get my experience verified through that process and get my License from New Hampshire after moving my score there? Thank you for this video. I had a question and am hoping you’ll be able to help me out. I am currently stationed in Florida but working for a company in NY, under the supervision of a CPA licensed in NY. All my foreign credentials have been evaluated by NASBA, and I am now attempting to sit down for the 4 part exam. Can I take the exams in Florida, instead of NY? Given my experience, I guess eventually I might reside in NY, but i’m not sure. Also is there a way to hold multiple licenses in multiple states? Thank you very much for your website. I am in a tricky situation that i hope you can help me. I am international student with Acct degree and 2 master’s all earned in US. I just passed all my CPA exams in Kentucky and planing on going to law school. I just found out that Kentucky has has 5 years period for you to obtain 1 year experience before my CPA exams expired. I am little worried about if i am going to law school and its going to take 3 years to finish. what is my best options here to avoid have my CPA exams expired. I am looking for any advice you can give me. I am having difficulty with experience requirements in CA, and wonder what are my best options. 5. Own my own company, Corp. I passed my CPA exam 15 years ago when I had a bachelors in accounting, I got my masters in accounting 2 years ago. I had submitted my experience from an old job 14 years ago and i had acquired 6 months of work experience which I had submitted. I currently work in not for profit since I passed my exams and my both my immediate boss have been active CPAs. Can you give me suggestions on how to proceed to get my CPA license. Hi! I have been recently accepted to write the CPA exam in California state. I am on a dependent visa in the US and hence cannot work. However, a small scale CPA firm wants to offer me a job as an unpaid trainee, and they are expecting me to get a letter from the CBA which says I am allowed to get trained by them. Is it OK for them to train me and will the board provide a letter?